Habit: Plant a mat, loosely spreading at margins where branching sub-pinnate; green aging orange-brown. Leaf: of main stem 0.4--0.6 mm wide, tip pointed up, acute; under-leaf of main stem 1.5--3 mm, +- lanceolate or sickle-shaped, decurrent, over-leaf 1.3--1.5 mm, lanceolate, not decurrent, base hairy or not; awn 0--0.03 mm. Cone: sparse, 3--10 mm. Ecology: Shaded sites, sandy or gravelly soils, at base of rocks, in cracks; Elevation: < 1100 m. Bioregional Distribution: e PR, DSon; Distribution Outside California: to Arizona, northern Mexico. 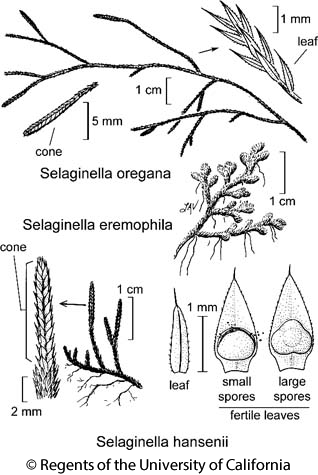 Citation for this treatment: Paul Wilson & Thomas J. Rosatti 2012, Selaginella eremophila, in Jepson Flora Project (eds.) Jepson eFlora, http://ucjeps.berkeley.edu/eflora/eflora_display.php?tid=44055, accessed on April 19, 2019.
e PR, DSon; Markers link to CCH specimen records. Yellow markers indicate records that may provide evidence for eFlora range revision or may have georeferencing or identification issues. Purple markers indicate specimens collected from a garden, greenhouse, or other non-wild location.